An insightful Forbes article described culture as the backbone of a happy workforce. That’s a great metaphor because a positive company culture favorably impacts recruitment, increases job satisfaction, inspires collaboration, boosts morale and reduces stress. March: Time to Build Workplace Happiness! Get your calendar out and start scheduling some fun – happiness will follow! March is the ideal month to build workplace happiness – winter is dragging on and for most of us, spring seems a long way off. February is Kindness Month – Share Yours! Acts of kindness are one of the most powerful ways we have to connect with others. February is the perfect month to share workplace kindness – with Random Acts of Kindness Day (17th) and Week (February 17th though the 22nd), and Valentine’s Day! With an acceptance rate under 7% and ACT scores of admitted students hovering around 32-35, the likelihood of most people having access to an Ivy League education in Yale’s hallowed halls are slim. It’s here!! 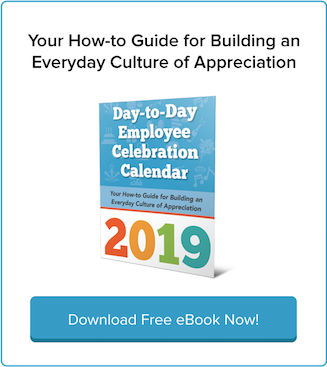 Our very popular Day-to-Day Employee Appreciation Calendar is newly updated and back for 2019! Users have told us they love the monthly and daily idea format and the updated content on how to build a loyal, happy workplace culture through engagement and gratitude. 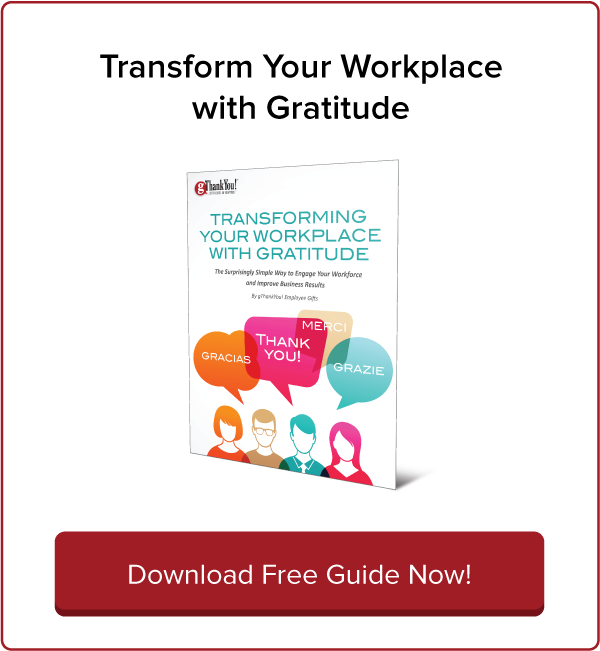 Gratitude in our personal and professional lives is a trending topic these days, but when we first introduced our popular ebook, Transforming Your Workplace With Gratitude, in 2013 we were in the vanguard of the workplace gratitude movement as it relates to company culture and employee engagement. Why are people in some countries happier than others? What factors contribute to happiness and how can we improve happiness at home and in the workplace? We can apply lessons from the happiest countries in the world on how to be happy. On September 3, the Greater Good Science Center at the University of California, Berkeley, will launch a new online course, “The Science of Happiness at Work.” Based on the center’s hugely popular free course “The Science of Happiness,” this new course will teach attendees why it matters so much to promote happiness in the workplace and how to do it. Beloved Wharton School professor Adam Grant’s 2013 bestseller, Give and Take, used groundbreaking research to show that giving can have a revolutionary positive effect on all kinds of businesses. Summer is an opportune time to cultivate workplace community by volunteering in the community as a team. Just in the month of June alone there are two officially designated dates that you can celebrate: The United Way’s Day of Action 2018 which occurs on (or around) June 21 and United Nation’s Public Service Day on June 23. Build Workplace Kindness With a Smile Day! National Smile Power Day is June 15th, but every day is the perfect day to fuel workplace kindness with more smiling! Studies have revealed the ways that simply smiling more can transform us and those around us. Gapingvoid Culture Design Group uses art and design to help businesses change their corporate cultures. In the company’s own words, its mission is “to make work more meaningful; helping people love what they do.” So how exactly does Gapingvoid go about doing this? Loyalty in the workplace looks different now than it did a generation ago. Staying at one job with one employer for your entire working life and retiring with a gold watch is far from today’s norm. Kindness in the workplace is a big part of cultivating a happy, engaged workforce. What better time to celebrate it than this week during Random Acts of Kindness Week? The theme of #RAKWeek2018 is “Who’s your one?” — as in, Who’s the person who starts the chain reaction of kindness in your life? Happy New Year! Is thanking employees more frequently in 2018 on your management team’s list of resolutions? How about a “Thank You training”? 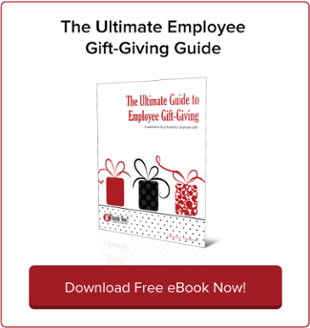 Make it a company resolution this year to train managers in the art of thanking employees! We hope you have a peaceful and happy holiday celebration. Whether you’re spending the holidays with family, friends or colleagues, we hope it’s a time of gratitude and joy. 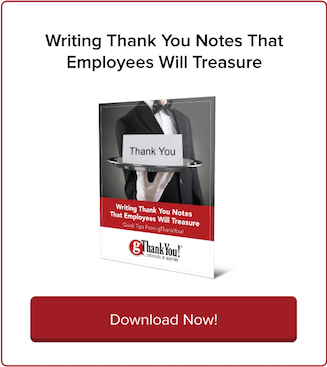 gThankYou’s popular Employee Appreciation Calendar for 2018 is here! We’ve updated our annual day-to-day appreciation calendar with lots of new topics, new case studies and even more holidays and reasons to celebrate!